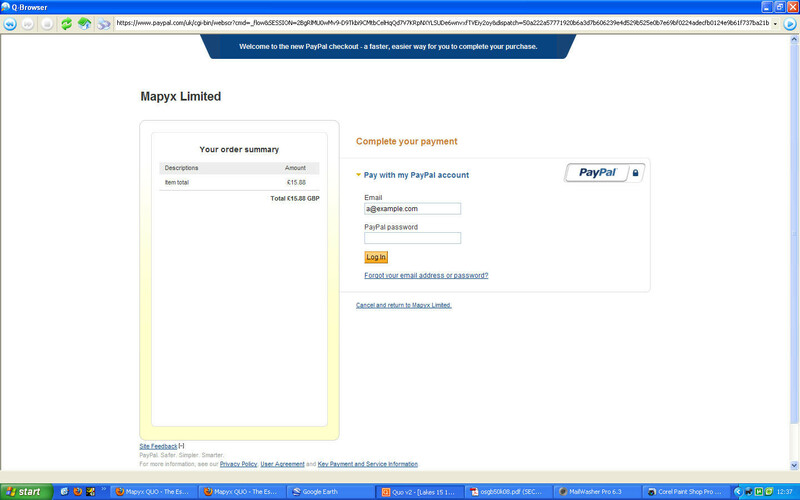 Pictured above is the page I got yesterday when I tried to use Paypal to buy some Quo tiles. Click it for a larger version. Pictured below is the one I got when I tried it again today. See how there was no little padlock security symbol at the bottom left y/day, but there was today? Presumably that’s something to do with the fact that y/day I went to the tiles from within Quo and therefore the page loaded in the Quo browser, whereas today I used Firefox. I’m sure there’s no problem with Mapyx, and I expected the Paypal representative to confirm that Paypal had simply introduced a new page. He was insistent that they hadn’t though. Anyway, I’ve emailed Paypal about it, in accordance with instructions from the rep. Maybe they’ll email back and explain. 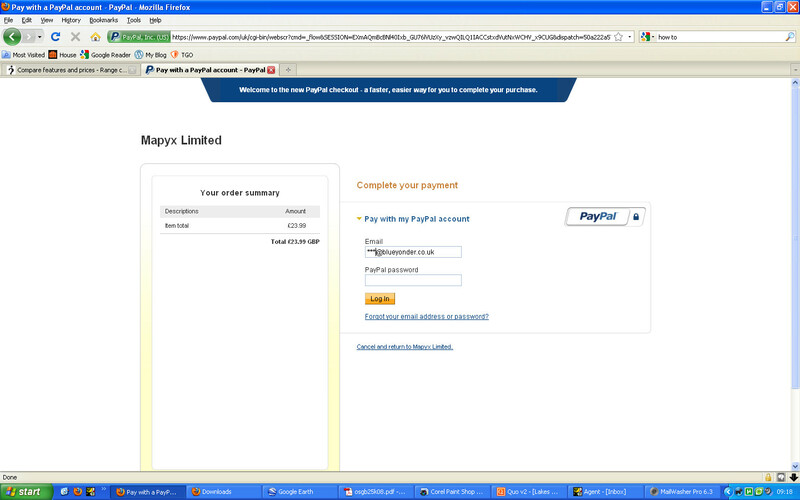 This entry was posted on Tuesday, April 19th, 2011 at 9:26 am and is filed under Paypal. You can follow any responses to this entry through the RSS 2.0 feed. You can leave a response, or trackback from your own site. I reckon it could be the Quo Browser window. It appears to be a bodge of IE. Could be, though I got the same page in Firefox. Ah, well! Hi Shirl. Maybe I’ve misunderstood you, but if your concern is the missing padlock I shouldn’t worry about it too much in this case. I agree with Andrew – it looks like the Status Bar or whatever it’s called isn’t working on the Quo browser window (where it shows “Done” and the padlock symbol in Firefox). I’m pretty certain (and Andrew will correct me) that this doesn’t necessarily mean that the site isn’t secure. I think I’m right in saying that the prefix “https:” (as opposed to the more usual http:)in the website address activates the padlock symbol; but of course the browser does have to have the ability to show the padlock for it to appear. The fact that the address then says http://www.paypal.com makes me pretty confident that you’re on the PayPal site and it’s not a scam or even a legit 3rd party. As for “Welcome to the new PayPal checkout, the ……..” is it new? I thought I’d seen it around for a while, and it just looks like marketing hype. Excuse me if I’ve got the wrong end of the stick and you know all this already. I know you’re pretty clued up on websites – – after all, you put together your own (much missed) website. Just thought I’d add — Thank goodness there are people like you who are careful and questioning or the www would already have turned into a disaster. It wasn’t so much the missing padlock, though I did wonder about that. It was more the stuff at the top of the page about it being a new checkout page. Since the look of it was unfamiliar to me I rang Paypal just to double-check that they’d put up a new page, but the bloke I spoke to insisted that they hadn’t and advised me not to use it. I still feel it probably is a new Paypal page introduced by Paypal–certainly I don’t have any concerns about Mapyx–but we read so much about scams and cunning tricks (none of which I understand) that I reckon it’s as well to be cautious. I only wish I really did understand more about all this stuff! Putting my page together didn’t require any clever internet skillz, as my accidental allowing of the domain name to expire unfortunately demonstrates *g* I’ll have another go at getting it back, but if I can’t then I’ll upload it all to weepiglet.com.